Spring has definitely sprung here in northern California. I was feeling the need to get something spring hung up. 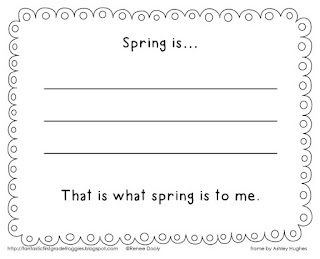 So we went on an impromptu spring walk around school and then brainstormed things we noticed or we know that relate to spring. After our brainstorm session, I gave them a circle map to fill out. They had to put one word in each circle that reminds them of spring. They were to use this circle map to help them complete a spring writing. The next day, I pulled out the watercolors and just let them paint what they wanted, as long as it was a spring theme. They loved having a chance to free paint. This was my favorite. A boy flying a kite. It was a reminder to me that I need to let them have free paint time more often. Has spring sprung where you live?